Next to a good fly rod setup, a decent pair of waders might probably be the most important piece of gear a fly fisher can have. With all those different options and features available today, choosing the best fly fishing waders can certainly be time consuming. We try to shorten that process for you, so you can spend more time on the river and less time in front of a screen. 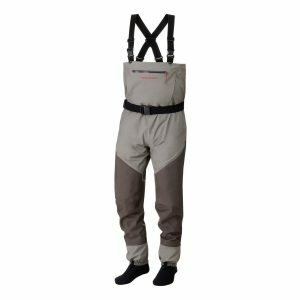 When it comes to choosing the best fly fishing waders, there are a few things you should take into consideration. While some waders might perform perfectly on a cold winter day, they could be a horrible choice for a nice day in spring. Therefore we highly recommend to choose accordingly to the environment you plan on using your waders in. The three aspects that affect their performance the most are the following. While back in the days rubber waders were the way to go, you will hardly find anyone using them on the river anymore. They got slowly replaced by more breathable fabrics and the better insulating neoprene. 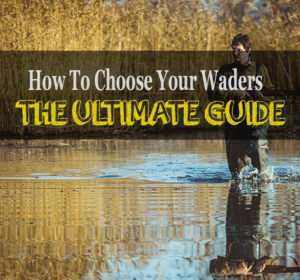 Whatever you plan on doing in your waders, those two choices outperform rubber every time! Do you plan on fishing in extremely cold temperatures? Do you hike through thick brushes to get to your desired fishing spot? Well neoprene might be a good choice then. It generally keeps you warmer than it’s counterpart and is definitely more durable. You can choose between 3.5mm, 5mm, and 7mm, and the latter is certainly nothing you want to wear until temperatures reach sub zero. It’s not snowing all year around in your state? You want to fish even during warmer days? Then breathable is the way to go. Since you can always level up your insulation with a few layers underneath, you will pretty much sweat to death with 5mm neoprene waders once the winter is over. Breathable waders are definitely more popular among fly fishers, since they just perform better in a wider range of temperatures. They are also generally lighter than neoprene and therefor fit great into the whole ultralight fly fishing movement. Two things to choose from here, bootfoot and stockingfoot. Bootfoot waders come with already attached boots (who would have guessed) and stockingfoots offer a neoprene sock instead. Since you can’t really wade that good in socks, stockingfoot waders require separate wading boots. Can’t be bothered spending even more money on separate wading boots? You are more afraid of cold temperatures than of slippery stones? Bootfoot might be the better choice then. While the attached boots are inferior to a proper pair of wading boots, they often come with a decent insulation. Overall they are usually cheaper as well and you will never find yourself arriving at the river, only to realize you forgot your boots at home (yes, this actually happens from time to time). Inferiority is not an option for you? You already own a pair of wading boots? Wearing a decent pair of wading boots can make a huge difference in the river. They provide a superior sole and way better ankle and heel support. This is not only about comfort, it’s about safety. Tripping over in a fast flowing river isn’t a joke and sprained ankles are probably the most common injury among fly fishers. Therefore we highly recommend going for the stockingfoot option. Bite the bullet and spend a little more money here, it will pay out on the river. Since it feels like there is about one new must have feature released every other day, we will try to cut it down to the stuff that’s actually worth the money. Certainly a must-have. How would you feel if your waders tear up the first time you kneel on a slightly sharper rock? The knee area is definitely the one taking the most beating and a reinforcement here can save you stress and money. Gravel guards keep all the small debris out of your boots. Standing in the river for a few hours can fill up your boots pretty quickly, with sand, gravel or whatever else flows along. Since it’s one less item you have to care about, it’s worth getting them already attached to your waders. Where is the fun if you own all this fancy fly fishing gear, but see yourself forced to leave half of it behind cause you can’t carry it? Fly fishing vests, while still having that little something, are getting slowly replaced by sling- or chest packs. So what if you could have a chest pack build right into your waders. It won’t offer as much room as a medium sized pack does, but some waders actually have a decently designed pocket system, with zippers, mesh and some other fancy extras. Definitely nice to have! We all know how easy it is falling into a shopping rampage once you start buying fly fishing gear. There is always something new you absolutely need and there is always something better than what you currently own. Let’s face it, self control is tough once you enter a fly fishing store, no matter if it’s online or offline. To avoid overspending while buying waders you should set yourself a budget before even having a look at all the stuff you can get. Why? 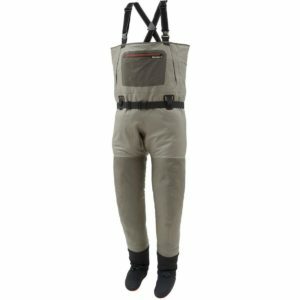 You could find the best fly fishing waders for your needs, great price/ performance ratio and offering everything you could ask for. Next thing that happens is you see a pair, costing 20 bucks more, with a nice little extra feature, nothing necessary but nice to have and come on, what are 20 bucks anyway? But guess what, look a little further and you find another pair offering an additional – even better- feature for again, 20 bucks more. And this goes on and on. Think about how often you will use them, how much you can justify spending and then choose what you are actually going to spend. Simms waders are nice, but if you only going to use them for the day of fishing every other month, it might be an overkill. We used those listed aspects to choose the best chest wader for fly fishing on the market. We tried to cover every budget and find the best waders in every price range. All of them pretty much dominate in their segment and no matter what you choose, you can’t really go wrong with any of them. Those quick reviews should give you an idea what you can expect and we reviewed all of them in-depth and separately earlier. Starting off with a pair of neoprene waders. Although there are rarely any situations out there where neoprene beats breathable materials for fly fishing, those situations still exist. While 3.5mm is as thin as it gets for waders, it still offers better insulation than all of the other waders on this list. It will also beat all the others in terms of resilience. If you have to cross passage of thorn bushes every time you go to your favorite pool, neoprene is the way to go… you get the idea. 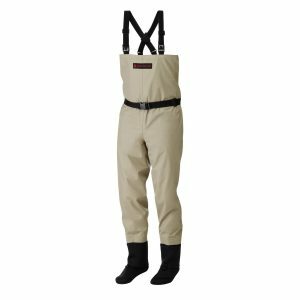 Reinforced knee pads are the must-have we talked about earlier and the pretty solid stitching overall rounds up this nice pair of waders. Another thing definitely worth mentioning are their boots. Bootfoot waders usually can’t really show off here but the Allen Cattail certainly can! The boots come with a toe cap, a steel arch for extra heel support and great tread. As result they provide the best heel and ankle support we ever saw in bootfoot waders and therefore really deserve a place on this list. In addition to that a 1000g Thinsulate insulation should keep your feet warm, even in ice cold weather. Same price class, different Material. The Redington Crosswater waders are without a doubt the best waders for fly fishing you can get for under $100. For only 100 bucks you get triple sealed seams and 3-layered polyester. While not as tough as neoprene this combination should easily survive the challenges a day of fly fishing can come up with. It was also hard to find a pair of breathables for that price but the Crosswater do exactly what you would expect them to do. They limit the extensive sweating you might know from neoprene while at the same time keeping water out effectively. This is possible thanks to a special chemical treatment called DWR. Durable Water Repellents are used quite commonly for outdoor gear, for instance the popular material GORE-TEX relies on a similar technology. In terms of features you get gravel guards, a wading belt and a flip-out pocket which is pretty much more than you could ask for in this price range. All the basics are covered and opposing to most other cheap waders, the Crosswater waders offer belt loops, improving safety and comfort. It should be mentioned that they can sit a little tight around the waist area for some people. The big brother of the Crosswater wader reviewed earlier. You will find everything you find on the Crosswater, just with a little upgrade. Instead of 3 layers you get 4. Instead of stitched seams you get them taped and sound-welded. Needlessly to say, both improvements increase the overall quality and durability of a pair of waders significantly. Waders in a higher price class also tend to fit better. While the Crosswater waders might look a little baggy from person to person, the Sonic Pros look slim and athletic. Yeah sure, it’s fishing, not a fashion contest but well fitting waders offer more than just good looks. Ever stood in a fast flowing river and felt how hard the current is trying to tow you away? Slim fitting waders offer less surface which results in less towing. Nice bonus right? In terms of features you get the wading belt, belt loops, gravel guards, bilateral handwarmer pockets plus a pretty unique wader pocket system, consisting of a big one, a flip-out pocket and a mesh tippet pocket. Enough room to store a fly box, pliers, some some tipper roles and might even convince you to leave your chest pack at home. All in all a really great pair of wader, suitable for every serious fisherman and great alternative to the high class Simms waders. Yep, you read that right. They actually cost five times as much as the first pair we showed you. If those waders were a car, it would be the S-Class. There a quite a few people that refuse to wear anything else and there is probably no brand as popular among fly fishing guides as Simms is. Simms is the only brand allowed to use GORE-TEX in their waders. GORE-TEX was pioneer for materials used in the outdoor industry. You can find it in jacket, in pants, in boots and yes, in Simms waders. Top notch breathability combined with durability, insulation and waterproofness, needlessly to say, a great fabric for waders. In the upper are you get it in 3 layers and in the lower half -which takes a lot more beating- comes with 5 layer. You might ask: Why did they bother to patent those seams? Well if you ever wore waders before, you might know that quite a few manufacturers struggle with fitting. Loose, baggy-looking waders are the result and for some reason Simms approach just works. They look great while wearing them and their fitting is outstanding. Makes sense to patent what works for them, right? Micro fleece hand-warmers, a big chest pocket and a removable flip-out bag roundup these high class waders and easily replace a small fly fishing chest pack. The straps are flexible and adjustable and are designed to cover them in seconds from chest to hip waders. You get a lot for you money, no doubt. The only thing you have to decide now: Do you want to make this investment? Yes, it’s an investment. A pair of waders in this price range and made with such quality will easily last a few years. 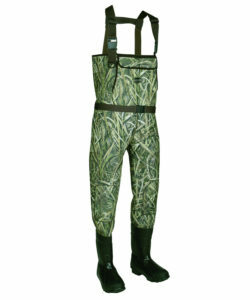 Spend 500 bucks now and wear a great and comfortable pair of waders with great features for at least the next 5 years. And that way, $100 a year doesn’t sound that bad right? We obviously tried to cover all price ranges. No matter what budget you had in mind, you should be able to find a pair here. There is absolutely no point in comparing the Simms to the Crosswater waders but both- and so do the other two- beat everything in their price range. All of them offer an outstanding price/ performance ratio you can’t go wrong with any of them. Think about how you will use them, how much you are willing to spend and what you actually need when you are out at the river. We hope we were able to save you some time with this quick little guide and hope even more that you spend it out there fishing. Tight lines!